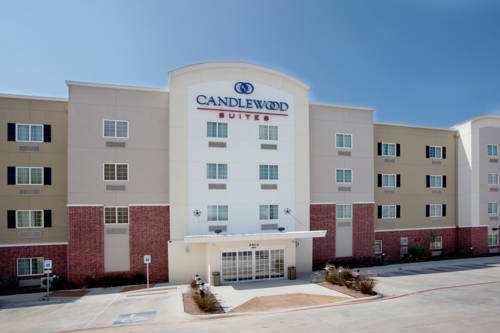 Explore San Antonio From Hotel's Convenient LocationWelcome to the Candlewood Suites San Antonio NW Near SeaWorld hotel, an all-suite hotel convenient to the most exciting attractions San Antonio offers. In a city known for its blend of cultures, you can enjoy everything from theme parks to Southwestern cuisine to historic sites, all are convenient with the hotel's location in northwest San Antonio, TX.Business travelers have a lot to love about this hotel's convenient location in San Antonio, TX. Midway between Lackland AFB and Camp Bullis, and close to area corporations including Valero Energy, the hotel's location lets them spend more time working and less time commuting.This all-suite hotel is a great choice for leisure travelers. Halfway between Six Flags Fiesta Texas and SeaWorld San Antonio, the hotel is also near the San Antonio Zoo and within an easy drive of downtown attractions such as the Alamo and the famous Riverwalk. Families appreciate the extra space to spread out in studio and one-bedroom suites.Whether you're looking for a place to work, a place to relax or both, you'll find everything you need in this extended stay San Antonio hotel's spacious suites. Enjoy free high-speed, wired and wireless Internet access throughout the hotel and a free, 24-hour guest laundry room. Work up a sweat in the 24-hour Fitness Center, and cool off with a dip in the outdoor pool. Begin planning your next trip to San Antonio today! From Shamu to dolphins, sharks, seals, sea lions, and much more, SeaWorld San Antonio is the the world's largest marinie life park! A comprehensive, four year public university serving the San Antonio metropolitan area, South texas, and the Rio Grande Valley. ~13 miles from San Antonio. ~21 miles from San Antonio.